I love online shopping, travelling, food, reading, and many other creature comforts. Today, I’ll be reviewing Queen Helene Mint Julep Masque! Okay, okay, I know most of you (especially in Asia) will not have heard of this before, but it’s pretty well known in the US! I must first comment on the size of this. Stack three lip balms up and you get the rough height. I couldn’t stack three lip balms because I’m uncoordinated and clumsy, okay? Stop harping on it already! That sounds pretty good, eh? Kaolin is sorta like clay (I think it had its roots in China? ), and it’s used to make pots and stuff! So essentially this is like a clay mask- thick and cracks upon hardening. This mask (masque) is quite refreshing and cooling, but not so much after you wash it off, and when it dries the mint smell fades and the sulfur in this dominates. Don’t worry guys, sulfur has been proven to be good for the skin and many skin products contain trace amounts! People go to hot springs for the skin benefits, y’know! And you get soft, supple skin! For some reason the mask was quite itchy when I first applied it but when I washed it off there was no redness or irritation, so perhaps it was cos I’m not used to clay masks? Anyway when I washed it off I got baby-smooth and soft, firm skin, so I quite like the feeling of this mask! I usually use this just before my bath, so I can wash it off and come out feeling refreshed! It does dry out your skin, being a clay mask and all, so people with dry skin should apply some moisturiser before and after using this mask! I just apply my after-bath moisturiser and I’m set! This body soap + scrub gives off a delightful fruity scent! Squeeze a tiny bit on your palms and rub accordingly. I really love its vibrant red colour and its scent. This body polish doesn’t dry out your skin- it leaves it feeling moisturised, clean, and super soft and baby-like! I think you can even skip the after-bath moisturiser ‘cos my skin feels really bouncy and soft, like after a good moisturiser. It doesn’t feel oily or anything, don’t you worry. So maybe they haven’t tried or noticed it yet. There is Sodium Lauryl Sulfate in this, which can’t be very good for the skin, but maybe that’s why there is brightening properties ._. It is rather tempting to use it everyday but I really want to make this tube last! Anyway, I think you shouldn’t use scrubs, no matter how gentle, on a daily basis because it stresses your skin out. Perhaps you could buy the Strawberry Body Polish that’s going on offer now, for Valentine’s Day. Buy 2 products from the Chocolate/ Strawberry Bath range, and get 20% off, or 3 products and get 30% off!! Strawberry is a delicious scent as well, but I prefer pomegranate because you get strawberry-scented things everywhere. I sometimes mix this in with my facial cleanser and viola! A face scrub! Do a spot test if you are known to have sensitive skin 🙂 But it really makes my face feel baby-smooth and soft~~ * sighhhh * What’s not to love about this? Price: 18.90 SGD (regular price, but most times they go for 12.90SGD or even down to 8.90SGD at new store openings) , or you can get the Strawberry one on sale during the Valentine’s Day period i.e. NOW! Okay, okay, I’ll tell you now. Let me tell you what I do whenever I get really bad breakouts. I don’t use skincare products during really bad breakouts except cleanser once in the morning and at night, like mosturisers and whatnot. Instead, I turn to natural methods to get rid of the acne! I use green bean powder, mixed in water, and apply it like a mask. I bought mine from an organic health food store which has barley and rice bits mixed in for added whitening properties that doubles as a scrub. It is located near Bukit Batok MRT and goes by the name of ‘Vitality’. My mum bought this for me though, so I’m not sure of the exact location.You should be able to buy it in supermarkets though, as it is used in cooking. You don’t actually need the mixed version. The powder I used last time was purchased from NTUC. DO NOT BUY ‘GREEN BEAN FLOUR’. It looks very similar. If you don’t see any green bean powder, it goes by an alternative name- mung bean powder, which is the same thing. It should look something like this. I usually use lukewarm water because I’ve heard the effect is better (opening pores and all) but some people use cold water to reduce the inflammation and redness. If you really want to do that, I suggest you wrap ice in a thin towel and hold it to the inflamed areas (the towel is to prevent you from getting frostbite) after washing off the green bean mask. This can double as a face scrub due to its texture or you can leave it on as a mask. It will harden and make your face feel tight. You can choose to either peel it off or wash it off. If you peel it off you get the added bonus of getting rid of dead skin and blackheads on your nose (make sure you apply a suitably thick layer so you can peel it off). However, if you have dry skin, or a really bad case of acne, it would be better to just wash it off to avoid damaging your skin. I would suggest using warm/lukewarm water to wash off this mask as it clings on well. Too well for my liking when I am in a hurry sometimes ._. DO NOT USE YOUR NAILS TO TRY AND GET IT OFF! Check out this post byViva Woman(click). Her mask tips are interesting! Another update today! 🙂 Aren’t you lucky~I’ll be reviewing Skinfood’s Rice Mask Wash Off! For some reason, it feels kinda oily so I was afraid it would cause my face to break out 😮 I guess its really moisturising! It claims to be make your skin brighter so I guess what it does is whiten and slough off the dead skin 🙂 the after-effect is similar to the Holika Holika Kiwi Peel-off Cream (click to go) and my skin feels smooth and soft! After you wash it off, any oily feeling is gone *phew* and you are left with soft baby skin~I rub this in upon application then let it sit for 15-20min as recommended.You can let it sit longer or shorter if you want, I tried it for about 3min another day with about the same results, then for 40min for another. Leaving it on longer just makes the ‘soft, bouncy’ feeling last longer, that’s all. Remember not to over-use this even though the rice husks are quite gentle! At most three times a week! I really like the fragrance of this mask- it has the underlying scent of cooked rice but has this perfume-y smell that is really quite pleasant, too. It reminds me of The Face Shop’s Rice Cleanser. Today, I’ll be reviewing Holika Holika’s Smoothie Peeling Cream (Sunshine Golden Kiwi)! This was part of my haul over the hols in Brunei. I know, no one goes there right ._.and no global brands like Starbucks or Forever 21, can you believe it? Thankfully, the Korean beauty industry have managed to set root and they are swarming all over in all the shopping malls (though there are about 4, 5 malls only). You see brands like The Face Shop, Holika Holika, Tonymoly, Etude House, The Body Shop (not Korean though). Its near-impossible to peel off. The mask is supposed to remove dead skin and dirt, and after trying it myself I’m amazed at how soft my skin feels. Like all the dead skin has been removed and I’m left with soft, kissable baby skin! *squeals~* I try to restrict myself to use it only twice a week, but I’m so tempted to whip it out everyday, y’know? The smell is so delicious and it feels so refreshing… even when I put it on an oily face it just cleanses the oil and leaves it soft and clean! It is totally my favourite mask now! Also, if you over-use this mask, your skin will start peeling off. So unsightly! Hates: None, but don’t over-use. I think I’ll try other products first before making a decision… but I totally love this!! I went back to purchase it again, and this time I consulted the saleslady. Apparently a ‘peeling mask’ means that it helps to get rid of dead skin cells, and it should not be peeled off. You need to wash it off after you apply it, and it is best used as a gentle scrub and then let it sit, if you like, as a mask. I just loooooove The Body Shop. How could you not? You can smell the shop a mile away- those delicious, fruity smells! I love how they give out those small little sample containers during a new shop opening or for whatever occasion- I just run there and start sampling! I always come out smelling like I’ve just walked into a lovely tropical garden. Back to the picture. 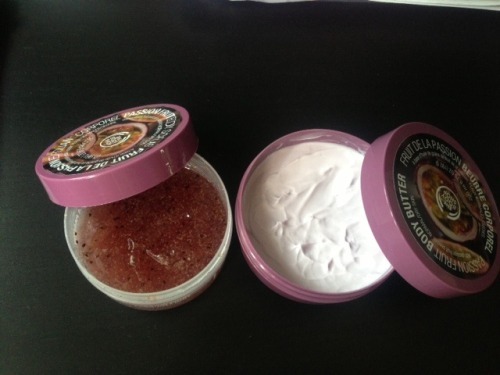 This is the passionfruit body scrub (left) and the body butter. The body butter is actually pale purple, but you can’t really see it here. The scrub is quite gentle, and leaves your skin smelling nice, and soft to the touch; but like most scrubs you really don’t want to use it more than twice a week in case you rub too zealously and damage your skin. The body butter is suited for normal to dry skin, and I like it because its not oily. I’m thinking of getting the Shea butter for my calves because I have this really awful-looking ‘snakeskin’, but as for now this is fine. Do you guys have any products from the Body Shop you love as well? 🙂 I’ll post more reviews next time! UPDATE: The body scrubs and butters are on 30% discount now, so do snap them up quick!